Remember Amblin Entertainment’s logo that features something along the lines of a flying bicycle with a pram in front of it? Well, this particular ride has been dubbed as the First Flying Bicycle where it will also cause $45,000 to “fly” away from your bank account if you decide to purchase one of these puppies. The thing about the Flying Bicycle is this – it can actually take to the skies, now how about that? Proud to be touted as the world’s first bicycle which will also double up as a flying ultralight para-trike aircraft. The latter is made possible whenever the para-wing is deployed from an integrated backpack, where it will be able to provide lift. Apart from that, there is also a powerful two-stroke gasoline engine which will power the craft’s three-bladed carbon fiber propeller to deliver a maximum airspeed of 25 mph. 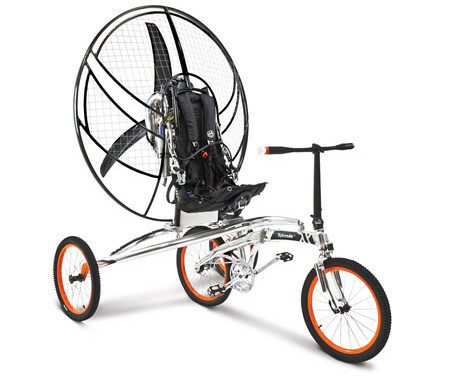 The Flying Bicycle has been specially designed to cruise at low altitudes (below 4,000′), having an approximate range of 75 miles from a full tank, operating from any suitable area of open space.